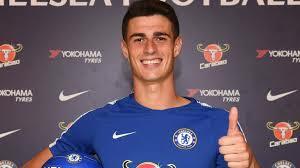 English Premier League side Chelsea broke the world transfer fee record for a goalkeeper after announcing the signing of Kepa Arrizabalaga from Athletic Bilbao on Wednesday evening. The Blues paid 80 million euros to trigger his release clause, breaking the previous transfer record for a goalkeeper held by Liverpool's Alisson Becker, who moved from AS Roma for 75 million euros last month. Sportstalk Nigeria can report that former Super Eagles captain Vincent Enyeama is the most expensive Nigerian goalkeeper in history, with Hapoel Tel Aviv paying 500,000 dollars (approximately 430,000 euros) before snapping him up from Bnei Yehuda in 2007. Thus, Chelsea paid 186 times the value of Enyeama, ignoring adjustment for inflation, before signing their new goalkeeper. Enyeama's record has stood for eleven years and is unlikely to be broken in this summer transfer window as two of the top three most valuable Nigerian goalkeepers are not expected to change clubs. At one million euros, Deportivo de La Coruña starlet Francis Uzoho is Nigeria's most valuable goalkeeper, followed by Enyeama who is now valued at €750,000 and Chippa United's Daniel Akpeyi whose market value is €650,000.